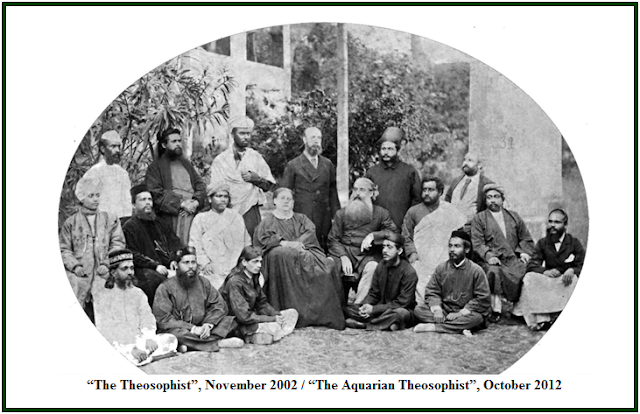 The above photo was taken at Adyar, India, in the 1880s, and shows several leading pioneers of the theosophical movement. Sitting in the center one sees Helena Blavatsky and Henry Steel Olcott. Mr. Alfred P. Sinnett, the British journalist to whom most of the Mahatma Letters were sent, is standing in the center, between Blavatsky and Olcott. Mr. S. Ramaswamier, whose narrative about his meeting with a Master is published as Appendix A in “Letters From the Masters of the Wisdom”, First Series (TPH, 1973), is sitting next to H. P. Blavatsky, in her right side, or left side from the point of view of the reader. Damodar Mavalankar is on the ground, at the feet of Helena Blavatsky, on her right side (or left side from the point of view of the reader). Mr. Mohini Chatterjee, who made important contributions to the Cause before abandoning the movement, is sitting on the ground, near Olcott. Mr. Norendro Nath Senn, who had contacts with Masters (see Letter 59, Second Series, in “Letters From the Masters of the Wisdom”) is sitting in a chair. He is the second after Olcott, if one goes from left to right, from the point of view of the reader. The text “A Photo From the 1880s” was first published in the October 2012 edition of “The Aquarian Theosophist”, with no indication as to its author.